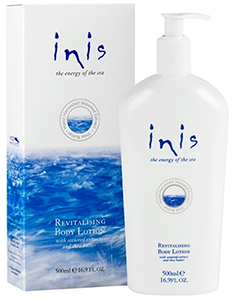 The Irish Gift House: Inis Body Lotion is Now Available in a Pump Bottle at The Irish Gift House! Inis Body Lotion is Now Available in a Pump Bottle at The Irish Gift House! TheIrish Gift House. This revitalizing and nourishing body lotion from The Fragrances of Ireland had been only available in a 200ml tube, but due to strong demand for a larger size container Inis body lotion is now available in a 500ml (16.9 ounce) pump bottle. Inis body lotion is unique in that it combines naturally harvested seaweed extracts along with shea butter. Shea butter is an extract from the African shea tree, and while the butter is eatable, it is mostly used as a moisturizer. Additional ingredients in this Irish body moisturizer include vitamins and minerals that can nourish your skin and you will be left scented with the cool and seductive fragrance of Inis the Energy of the Sea. Inis body lotion is perfect for a daily regimen of skin care and is best used immediately after your shower or bath; it is also excellent for use after being in the sun. Like all the products from The Fragrances of Ireland, Inis body lotion is made in Ireland and is never tested on animals. The Irish Gift House stocks many different products from The Fragrances of Ireland including their Inis perfume and the Garden of Ireland natural soaps. In addition to the women's Irish perfume, we also stock Patrick cologne for men.